Unless you have lived under a rock for the last couple of weeks, you have heard about the “ice bucket challenge”. Last time I checked, the ALS society has raised over 70 million US dollars. Nice. Honestly, after the couple of videos posted on Facebook, I grew tired of the selfies. A woman in Hyderabad has adapted this new form of fundraising to one of India’s main problems: poverty. She is asking that, instead of dumping ice water and ice cubes on our heads, especially since water is scarce and electricity (for the ice cubes) is also a problem, we challenge our inner circle to donate a bowl of rice to poor people. And because we are a very vain society, she says you should take a picture of yourself giving the bag to the poor person and post it on social media. 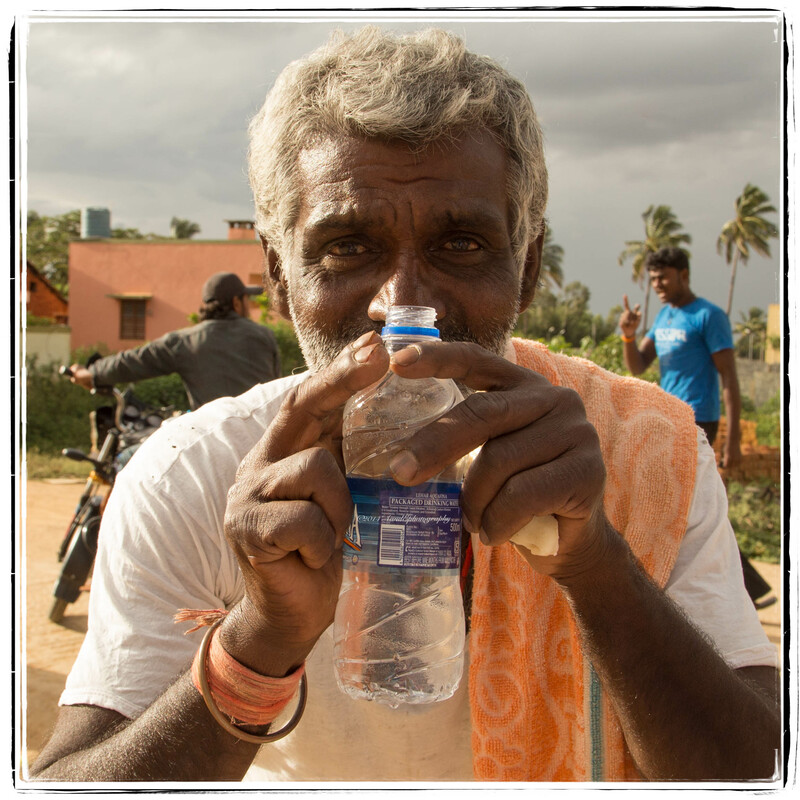 As you know, we have been distributing water bottles on our scooter rides. Today is the first day of Ganesh Chaturthi, a 10-day festival honoring Ganesh. Since E. had the day off, we went on a scooter ride checking for fun things to see, with rice! Unfortunately, I hadn’t planned it, so this morning when I raided the pantry, I only had enough for two 1-quart Ziploc bags of rice. Pretty pathetic, but it’s a start. We ended up in the village of Pura. An old woman was walking her two cows home. She was wearing a dark red sari, and was barefoot. Her two cows were nice, dark black, clippity clopping on a dirt path. She smiled at us and waved. We passed her and I asked E. to stop. I took off my helmet, for I do not want be confused with a Martian, walked about 100 feet towards her, and handed her the bag. She presented both her hands and I placed it them. She smiled, a bit confused because she now needed a place to put it. She nestled it in her elbow and thanked me. Namaste style. No other word, a smile. An older gentleman approached us. He was agitated, in the funny happy way. He was talking to us in, I don’t know, Kannada maybe, or Tamil? By some magic of human interaction, we understood he wanted to know where we are from. Whitefield. Oh, this is not the way, this road you’re going on is bad. Turn around, that road is good. A couple of kids were also there, probably using their English with foreigners for the first time. They concurred, we had to turn around. We gave all of them a bottle of water. We weren’t lost, we were just exploring, but E. turned the scooter around anyway, we weren’t about to disrespect him. And the old man started jogging in front of us to show us the way (video here on VespaVindaloo’s YouTube page), until we reached the “big” intersection. And then, he asked I take a picture of him. I know people who give should not brag about it, it’s in bad taste. But if anyone in India is reading this, and wants a warm fuzzy feeling, as a well as a few tears, do it. I challenge you to do it and not cry. Aside | This entry was posted in Casual observations, Money, Street photography and tagged Bangalore, expat, Ganesh Chaturthi, ice water challenge, India, Karnataka, philanthropy, poverty, Pura, rice, rice bucket challenge, rural, street photography, village. Bookmark the permalink. (fist bump) nice to know that not everyone fell for the “ice ice baby” gimmick! It’s a very effective new form of fundraising. But I doubt 12-year olds sent their $10.00 after posting on YouTube! sure thing 🙂 this weekend!